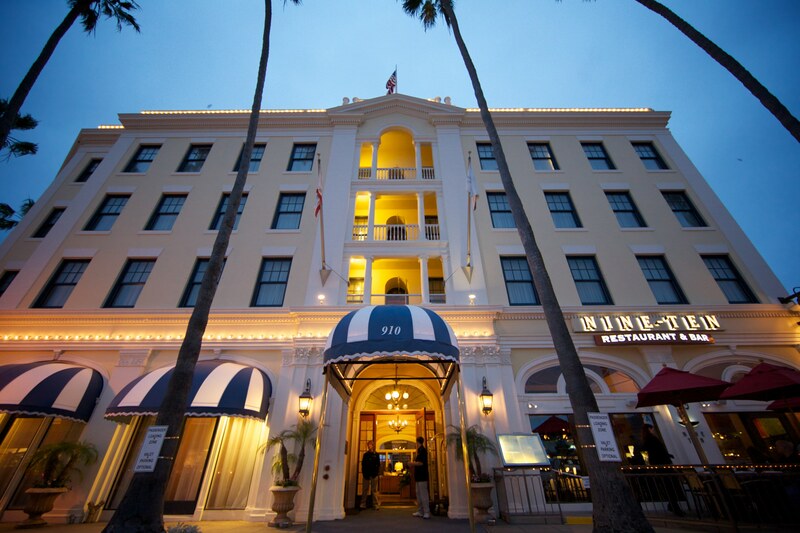 Amanda and Mike, exchanged their wedding vows at the historical Grande Colonial Hotel in the heart of La Jolla, CA. 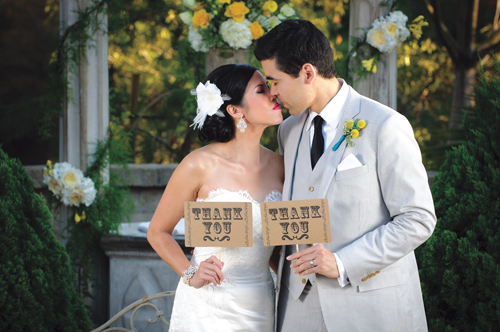 Having only twenty-six guests attending the wedding, the Grande Colonial was the perfect choice. There is no venue I love more for an intimate weddings. The hotel has a wonderful mix of old world elegance and modern flair, and when mixed with the location in the heart of the village, the incredibly gracious staff, and world class food (9-10 restaurant provides the multiple course meals served at all of the Grand Colonial’s events), an experience there is unmatchable. Amanda came to me just three months before the proposed wedding date and it was a true pleasure to assist her in planning every aspect of her wedding day. 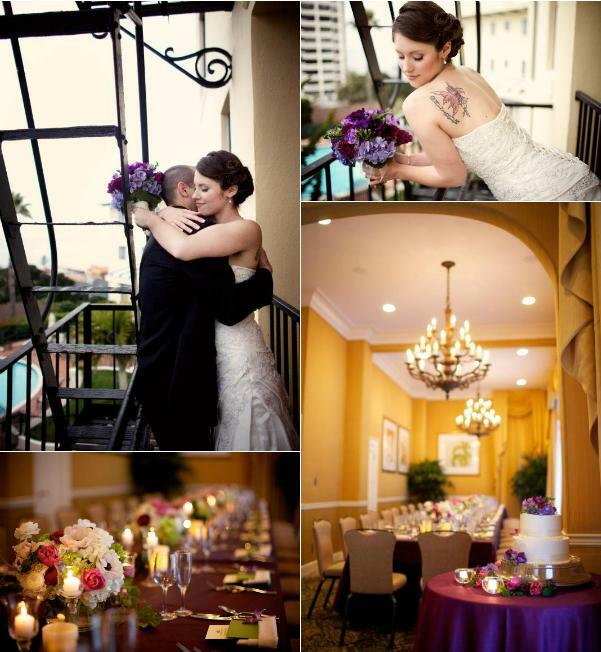 Sara France Photography captured the wedding beautifully. And Amanda was, as always, stunning. Shown above, on Amanda’s left shoulder is a tattoo of a pink pixie and “Malinda” in Old-English text. Malinda was Amanda’s grandmother – a woman she adored. Notice how the tatoo and flowers perfectly match! The ceremony took place just outside the lobby on the terrace steps, with peak ocean views of the La Jolla Cove below. Patti of Thistle Dew created all of the floral decor. Amanda wanted to use a mixture of purples and ivories and create a romantic and dramatic look. Cocktails took place in the terrace and by the fireplace in the lobby, and the reception took place in the intimate and beautiful La Jolla room. We created one long table for all the guests and placed Amanda and Mike in the center. To create atmosphere and energy, a live pianist entertained throughout the evening. But the four-course meal and personal toasts were all the entertainment truly needed. It was a very sweet affair! The in-house pastry chef from the Grande Colonial provided the cake and I think it is the best wedding cake I have yet tasted! I was so surprised! The hotel bills their pastry chef as only providing “simple cakes” so all my previous clients there have brought theirs in. Never again! I want Grand Colonial wedding cake from now on! Thank you, as always, to the Grande Colonial for such a wonderful event.